Sew Damned Creative: Paper Roses: They Live Forever! Paper Roses: They Live Forever! This Valentine's Day, after breakfast, Evie (my 8 year old) wanted to make something. She asked if we could make flowers because we all could enjoy them. I thought it was a brilliant idea! 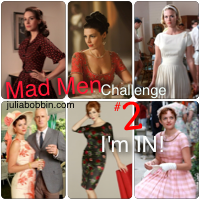 I told her we could do that and went about looking for inspiration online for making paper flowers. I came across this tutorial and It hit me that method would be perfect for the supplies we have on hand. It also would be really great fine motor practice, which my 7 year old, Abbie, needs. 1. I drew 12 4-inch by 4-inch squares on the red construction paper. 2. I drew a spiral on each square. Abbie said they looked like snail shells. 3. I cut each square out and divided them amongst the three of us. 4. 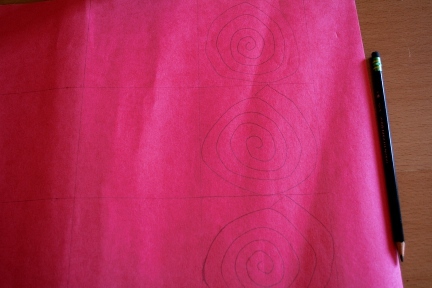 We cut along the small line of the spiral first. 5. Then we cut along the spiral all the way to the center. 6. We tightly rolled our spiral from the outside to the center. 7. We put a big drop of glue on the center, let the rolled portion go so it would unwind a bit, then pressed the rolled part to the glue and held for a few moments. 8. We set them on the table to dry. While drying we made some brownies for Daddy. They are his favorite. Abbie (L) and Evie (R) making Daddy's favorite dessert. 9. 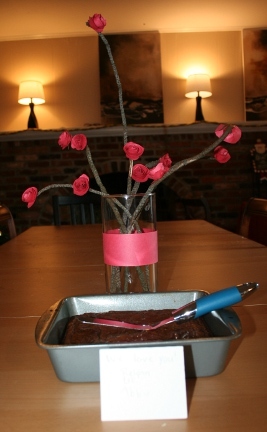 While the brownies baked we put big drops of glue on the twigs and pressed the roses to the glue for a bit. 10. 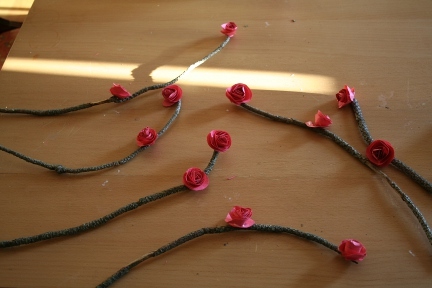 We let the roses dry on the twigs for about 20 minutes. 11. I wrapped the remaining construction paper (a 12-inch by 3-inch strip) around the cylindrical vase and glued the ends together while the roses/twigs were drying. 12. I arranged the roses in the vase. Tada! Sadly the flash washed out the note. It said 'We love you! Relynn, Evie, Abbie"
While having dinner that night we were talking about the roses. Both girls were incredibly proud that they helped make them. Abbie told Daddy "They are paper roses and will live forever!" Daddy asked, "But what if I set them on fire?" I immediately responded, "Then they will be Fire Roses, which is the title of one of my favorite poems. So they will still be awesome!" We all had a good chuckle.